The manifold is attached to the vehicle engine. It collects exhaust from the cylinders and directs it into the exhaust pipe. Gaskets seal the connection of the manifold to the engine and to other joints. A cracked or loose manifold or a leaking or damaged gasket can allow dangerous gases to enter the passenger compartment of a vehicle. One of these gases is carbon monoxide, which is colorless, odorless and deadly. For this reason, it is important drivers keep their exhaust system in good repair. 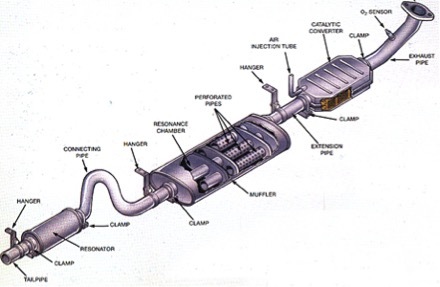 The catalytic converter is the next component of your vehicle exhaust system. It sort of looks like a muffler. Its job is to change dangerous gases into harmless carbon dioxide and water. The catalytic converter doesn't require any regular maintenance, but it can wear out. If it fails, in some areas, you will need a new catalytic converter to pass an emissions test in Wisconsin. Caring for your vehicle exhaust system at AUTO SELECT yields cosmetic benefits like quieting your engine sounds, but also may impact your health and safety.